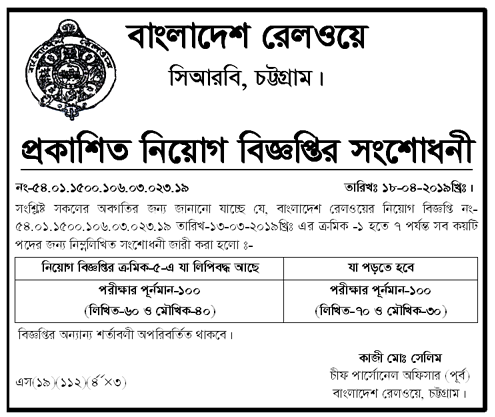 Bangladesh railway job circular 2019 has been published. It’s very important job circular to all unemployed people who want to work Bangladesh railway. If you want to get Bangladesh railway job circular related all information, you can visit my website that is jobs.lekhaporabd.com. Bangladesh railway is the most important department in our country. At present,Bangladesh government giving salary that is very high and it is too much need to Government service holder. So,we are easily understand that this job circular is attractive job circular. However,if you want to apply this job,you can submit your application within the Specific time. 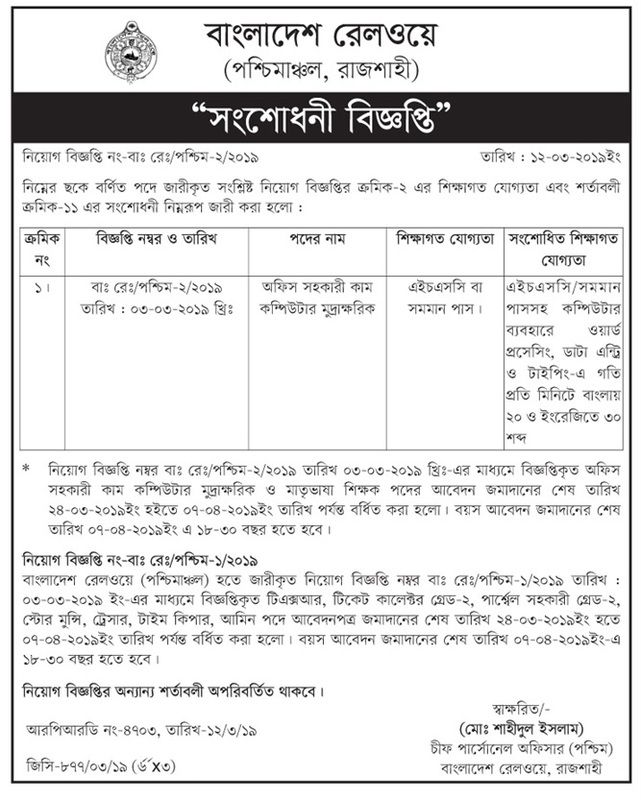 Bangladesh railway job circular 2019 has been converted to image file. Please see the image file that has been given below. Bangladesh Railway, a principle transportation agency of the country, is a Government owned and Government –managed organization. It covers a length of 2,877.10 route kilometers employing a total of 25,083 regular employees. As railway is a very important mode of inland transport, linking the entire length and breadth of the country, it’s healthy grow naturally contributes to the economic development of the country. authority (BRA) was formed with the Minster Ministory of Communications as its Chairman. The Director General is assisted by Additional Director General and Joint Director General to perform all administrative and policy making jobs. management. Each zone is again divided in two divisions, which are the basic unit of operation. The division is headed by a Divisional Railway Manager, who is assisted by Divisional Officers of various specialized Departments such as Personnel,Transportation, Commercial,Finance Mechanical, Way and Works Signaling & Telecommunication, Electrical, Medical, Nirapatta Bahini etc. Besides there are two workshop Divisions, one in each zone, located at Pahartoli and Syedpur, each being headed by a Divisional Superintendent .Further there is a locomotive workshop headed by Chief Executive at Parbatipur for general overhauling of both BG&MG locomotives. Bangladesh Railway also has Railway Training Academy headed by a Rector , a planning cell headed by a Chief Planning Officer, stores Department headed by a Chief Controller of Stores And Accounts Department headed by an Additional Director General/Finance for coordinating and advising Accounting and financial management activities of the two zones. To ensure safety of Railway transportation Government has set up a separate Directorate Under Ministry of Communications to inspect different works of BR relates with the train operation. 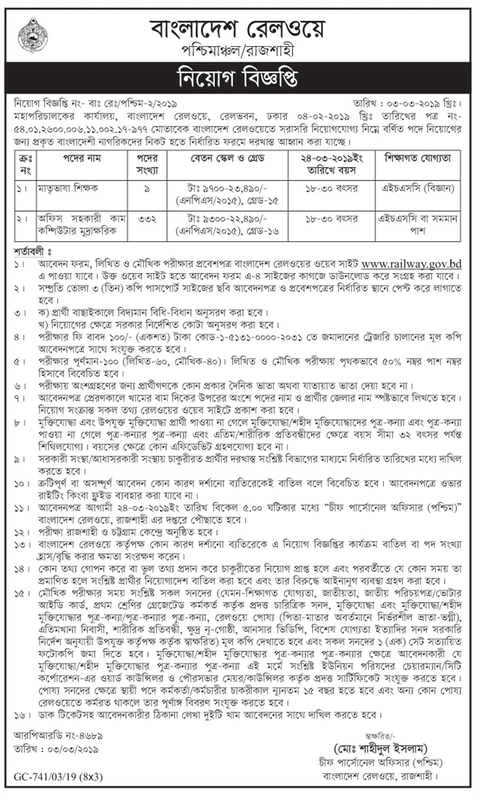 bangladesh railway job, Application Form, bangladesh railway job application form, railway exam date, www.railway.gov.bd job circular 2019, bangladesh railway result 2019 related all information will be published on our website.